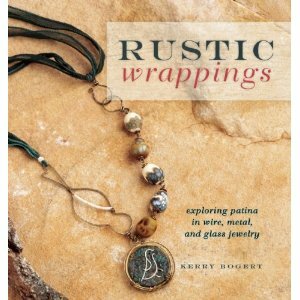 If you loved Bohemian Inspired Jewelry by Lorelei Eurto and Erin Siegel, you're also going to want to have Kerry Bogert's new book Rustic Wrappings. Here you will find that the emphasis is on wire rather than fibers, but the same spirit pervades both books. If you are familiar with Kerry's other book, Totally Twisted, you're going to somewhat shocked. The style of these new pieces is a complete turn-about from the bold, shiny, and brightly colored pieces you've seen before. Instead, Kerry takes a walk on the weathered, antiqued, and rusted side for this new collection. All three books are published by Interweave Press, and the new one certainly lives up to the reputation. Kerry shows you how to use common materials such as salt, vinegar, sawdust, and baking soda to add interesting effects to copper, silver, brass, and steel. She gives step-by-step instructions for creating patinas and includes a chart so you'll never be at a loss as to which recipe will work with which metal. Rustic Wrappings has 25 wire and art bead jewelry projects that will start you on your journey to obsessing with rust. And liver of sulfur. And vinegar patina. And potato chips (yes, you read that right!). I'll be sharing a bracelet that I made (partly) from Kerry's instructions over on Mixed Media Artist [note: it's there now!]. She made a more elaborate version, including glass beads, but I decided to keep mine simple and just to show off one of my personal favorite patina types. I loved Bohemian Inspired Jewelry and got some inspiration from it for my BSBP pieces I revealed today. This one sounds right up my alley. I love rustic, earthy pieces. I'll have to check it out. Thanks.